When your heating is on and you find that a radiator is cold at the top but hot at the bottom, this is a good indicator that air (or gas) is trapped in your system. You need to release this air to improve the efficiency of your radiators. This is very easy to do yourself, without the need to call out a plumber. When your heating has been on for a while, feel the top and bottom of the radiator. If the bottom is hot, but the top is cold, it's time to bleed it. Turn off your heating and let it cool a little. Put a small container or a towel on the floor below the valve to catch any excess water (which can sometimes be a bit mucky). 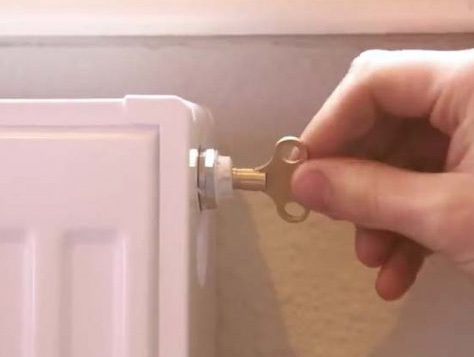 Then, using a radiator key or screwdriver (depending on your radiator) turn the valve anti-clockwise. You should hear a hissing sound as the air escapes. When the hissing sound stops or you see a little water coming out of the valve, turn it clockwise to shut it off. Once you have bled all of your radiators, turn the heating back on to check them again. Then also check the pressure gauge on your boiler. If it has fallen below the optimum pressure level you will need to adjust it using a lever or tap on your boiler to top the filling loop up. Please refer to your boiler instructions on how to do this as all boilers are different. 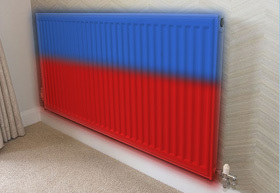 If you find that one or more of your radiators are still not getting as hot as the others, the next step is to balance your heating system as described in our next article. Cold at the top, but hot at the bottom? Time to bleed that radiator! 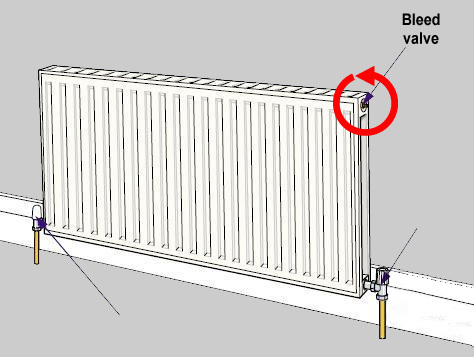 Turn the bleed valve anti-clockwise to allow the air/gas to escape.